Save $10 (CAD)per night by booking with us directly. Chanterelle Inn & Cottages featuring Restaurant 100 KM is the perfect place to take in the beauty and bounty of Cape Breton, Nova Scotia. The 100-acre estate sits high on a brae overlooking the estuary of the North River as it flows into St. Ann's Harbour and the Atlantic Ocean. For over 15 years, numerous sustainable practices and extraordinary made-from-scratch recipes have defined this refreshing and natural retreat. Today a refined, locally sourced menu and an extensive network of partnerships allow guests to easily taste and discover the best of the island. Historic Baddeck, Bras d'Or Lake and the North Sydney Ferries all close by, and Cape Breton Highlands National Park is only 45 minutes North. Those looking for a particularly special Canadian vacation can choose from the Custom Deals or ask for some friendly advice to enhance their trip. 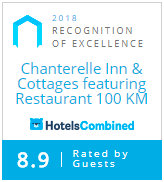 Book today and find out why National Geographic Traveler’s Stay List of the 13 “most authentic and unique hotels” in Canada featured the Chanterelle Inn. © 2019 Chanterelle Inn & Cottages featuring Restaurant 100 KM. All rights reserved. View site map. Chanterelle Inn & Cottages featuring Restaurant 100 KM website is served by Flavor Plate.